VATICAN CITY (CNS) — Pope Francis said that the Catholic Church must consider various ways to integrate the divorced and civilly remarried in the life of the church — not merely allowing them to receive Communion, but letting them serve as eucharistic ministers and godparents — and to make it easier for Catholic families to accept their homosexual members. The pope also said he would travel to three Latin American countries and several African countries in 2015, and that major reforms of the Vatican bureaucracy, including the possible appointment of a married couple to head a new office, will not be ready before 2016. Pope Francis made his remarks in an interview published Dec. 7 in the Argentine newspaper “La Nacion.” The interview, with journalist Elisabetta Pique, was conducted Dec. 4 in the pope’s suite at the Vatican guesthouse, where he lives. The pope answered several questions about the October 2014 Synod of Bishops on the family, which considered a controversial proposal to allow some divorced and civilly remarried Catholics to receive Communion even without an annulment of their first, sacramental marriages. By church law, such Catholics may not receive Communion unless they abstain from sexual relations, living as “brother and sister” with their new partners. The pope noted several currently prohibited activities, including teaching Sunday school and distributing Communion, that he said amounted to the de facto excommunication of divorced and civilly remarried Catholics. “Let us open the doors a bit more. Why can’t they be godfathers and godmothers?” Pope Francis said, dismissing the objection that they would set a poor example for the baptized. Such godparents are more worthy of their role than “political crooks” who happen to be properly wedded, the pope said. “We must go back and change things a bit, in terms of standards,” he said. Asked about his decision to dismiss U.S. Cardinal Raymond L. Burke from his post as the head of the Vatican’s highest court, the pope confirmed widely circulated reports that he had decided on the move prior to the synod; hence the cardinal’s positions at the synod, where he was a leading conservative voice, were not the reason for his reassignment to a largely honorary job with a chivalric religious order. 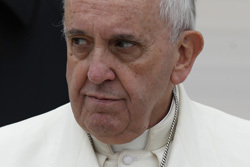 Pope Francis said his ongoing reform of the Vatican bureaucracy is a “slow process” that will not be ready before 2016. He said it was possible that a new office, the product of a merger of the current pontifical councils for the Laity, the Family and Justice and Peace, could be headed by a woman or even a married couple. The pope also announced that he would travel in 2015 to “some African countries” and three Latin American countries, not including his native Argentina, which will have to wait until 2016. I suppose some couples find it impossible to stay married due to abuse or alcohol or other problems. They are better off separated. They have to prove the vows were invalid in order to nullify their original marriage, so that they can legally marry again in the church. Well, it appears that we are going to have to open the gate of hell and recover all the souls lost due to sinfull behavior( I.e. Homosexuality and Adultery ). If, in fact, the Pope actually said this things, he is speaking against church doctrine and he should think about becoming a protestant. It would appear he believes that mortal sin no longer exist. If these behaviors are not mortal sins now, punishable by eternal damnation, then they never were. One has to wonder why Pope Francis seems incapable of speaking plainly and clearly when it comes to right and wrong. Listening to Pope Francis speak about openly defiant active homosexuals and openly defiant divorced/re-married Catholics, as if they are Catholics in good moral standing in spite of their open sinfulness against God’s Law, seems bizarre at best, and delusional at worst, because the Pope should know that God’s Law is not of this world. That the standards of right and wrong for the world are not God’s standards. There is a difference between feeling sorry for someone and absolving them of their bad behavior while they continue their bad behavior with no intention of ever stopping it. It is hard to understand how Pope Francis can rationalize away openly defiant and unrepentant sin, and then further encourage and allow that sinful behavior to permeate into Holy Mother The Church, as if it were normal behavior and no big deal. The actions of Jesus Christ through His first Apostles, St. Paul, and all the Church Saints regarding openly sinful followers is crystal clear. And it is not to welcome sinners with open arms and allow them full communion with the Church. Rather it is to counsel them of their sinfulness and to demand that they change their sinful ways. And if unsuccessful after several tries, to banish them completely from the Church. Pope Francis claims to believe in the Devil yet he does not seem to realize that by reducing the moral standards of the Church to conform to today’s amoral secular society, the Church is being marginalized and weakened from within, and many souls are being lost for eternity as a result. It’s as if the Pope and the Church itself are under the influence of a morally perverted disorientation where there is no sin, no consequences, no eternal Hell and damnation. Only lovingness, compassion, and guaranteed inclusiveness and forgiveness for everyone and everything. The Pope’s suggestion that divorced and civilly remarried people may serve as Extraordinary ministers of Holy Communion strikes me as strange and a contradiction of the purity of life needed for both the reception of the Eucharist as well as the distribution of it. It is my belief, echoing Pope Paul VI, that Communion in the hand has led to a lessening of belief in the Real Presence. I think that the whole question of the reception of Holy Communion by people who are living in a permanent state of adultery as well as the possibility of them distributing Holy Communion is simply the natural progression of a lack of faith in the Real Presence. This Pope confuses me.